Possibly the ultimate Sport Utility Vehicle. 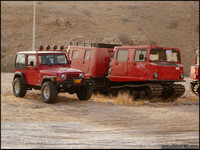 The Haggland BV206 is a military vehicle with tank-like drivetrain, and both the cab and trailer are powered. Steering is through a conventional steering wheel, and interestingly the vehicle is also Amphibious. 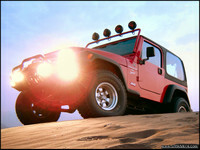 If you want go-anywhere capability, look no further. These two vehicles were found at the side of the road. If anybody knows the owner, please post in the comments section! Last changed on 01/21/19. This album contains 11 items. This album has been viewed 9494 times since 07/18/06. Last changed on 10/05/10. This album contains 11 items. This album has been viewed 3266 times since 07/16/06. AEV's Iceland Commander with cut out fender flares, 4" suspension lift, relocated rear axle, beadlocks and 39 inch tires, out for a spin in the Montana snow, USA. 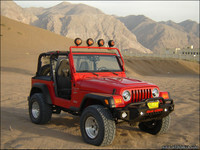 The vehicle would be perfect for the sand dunes of the Middle East, with lots of flotation and the 5.7L Hemi engine. Last changed on 03/06/19. This album contains 6 items. This album has been viewed 5478 times since 05/10/06. Last changed on 04/21/15. This album contains 11 items. This album has been viewed 3781 times since 04/14/06. 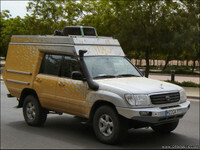 This Landcruiser had driven all the way to Muscat from Meinz in Germany, havin gone through Europe, Turkey, over to Iran and then a ferry across the Gulf to the UAE, and into Oman. It has 2 doors on one side, 1 on the other, seats 4, has a rediculous fuel range and the roof expands to sleep 4. Last changed on 01/25/17. This album contains 12 items. This album has been viewed 6356 times since 04/05/06.